Today marks the last day that all 26 student teachers are in the classroom. I am so glad we had the opportunity to spend time in the classroom while also enjoying the sightseeing of Ireland. 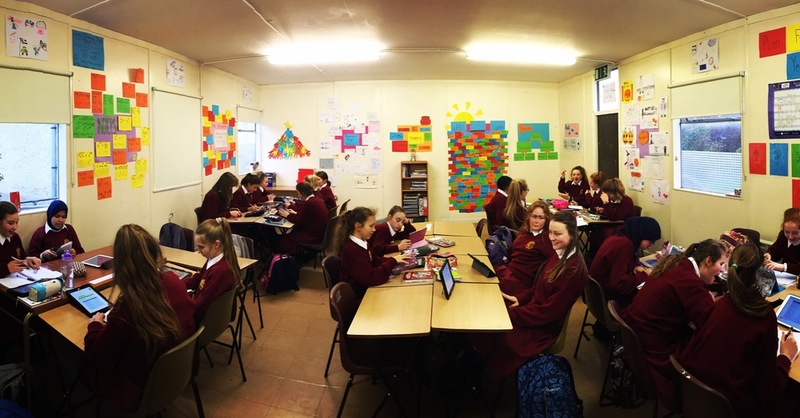 I am going to miss teaching in the Irish classroom and hope that someday I am able to return and maybe even professionally teach in the classroom some day. When I arrived at Sancta Maria College, I didn't know what to expect. Now that I am leaving, I am glad I didn't know what to expect because the output of sincerity and gratitude towards myself and John was so great - everyone welcomed us with open arms and were willing to work with us hands-on in the classroom. My last class of the day involved teaching the 1st Years about reviewing Order of Operations and more advanced mathematical expressions. After covering the main topics and going through some practice problems, I then took some pictures with the students so that I had a great way of remembering the unique individuals I had in the classroom. Before leaving, the principals of the school talked to us about our stay and wished a great future for both of us. I then handed out my gift to them - a Slippery Rock University pennant so that they could hang it up in the reception room for the next SRU students to see and feel welcomed. After school, we made our way back to the house to pack and get ready for the evening. At 17.45, we then made our way for one of the last times into Dublin City to go to the Arlington Hotel for our going away dinner. We arrived and were greeted in such a positive way - we headed down stairs for drinks and serving of food at the bottom of the hour. During this time, a group of men playing several different instruments performed on the stage. The food I order was a prawn salad, Beef and Guinness stew, and several select desserts to top it off (this also included several different unique drinks haha). The night ended with four dancers from Riverdance who performed to the band that was playing live. This was such a great treat seeing the dancers, the performers, and all of us under the same roof. It was a great time and special moment that I have been able to be part of now two times! We then made our way back around 22.30 and caught the 15B Bus home. Tomorrow is the last day that we are in the city and have the opportunity to explore the city one more last time on our own. Then it's an early evening as we have to be out the door around 5.50 in the morning!